Thanks God it’s seven o’clock. Time to buy stuff. That is the impression one gets of mobile users’ attitudes toward making in-app purchase of any kind. According to a new study of billions of app behaviors by AppLovin and Tune, the peak times for making mobile purchases are 7 a.m. and 7 p.m., right before or after work hours. The levels of in-app purchasing start to climb at about 6 a.m. and then descend quickly as 9 a.m. approaches. Similarly, buying activity ramps up again at about 5 p.m. and peaks at 7. All of the times were normalized to Pacific Standard Time, so peaks in other time zones are influencing the curves as well. One might expect that the lunch hour would experience a spike in m-commerce action, but the reverse is true. 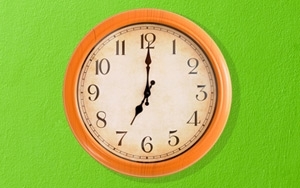 The 1 p.m. hour represents the true low in mobile buying, even compared to the wee hours of the morning. The weekends are when the most mobile purchasing happens. When overall mobile revenue for a week is broken down by day, Sunday is the peak, followed closely by Friday and Saturday. In fact 44% of mobile buying occurs across those three days. This is unlike typical patterns for desktop ecommerce, where Monday generally is seen as the revenue peak. Interestingly, the survey found that overall usage rates for mobile purchasing do not correlate with buying. Both usage and buying do peak on Sundays and dip significantly on Wednesday. But when you drill into time-of-day metrics, overall mobile usage climbs slowly throughout the day, peaking at around 8 p.m. People appear to be in a buying mood before work, if not in a mobile use mode. As mobility untethers the buy cycle from its standard anchor circumstances such as in-store, it seems the impulse to buy becomes more fluid. One doesn’t need to hit a buy button at a given moment, because that moment can be anywhere and anytime. But it still happens most often in the morning and evening, and most likely in the home. I would argue that buying is often aligned with lowered inhibitions: that point when the benefit or pleasure of a desired object outweighs the cost restraint. Even though mobility makes it possible to hit the buy button 24/7, there are still underlying rhythms of human moods that live apart form the technology.